It's strange days for DC Comics, as the company's "Rebirth" initiative is changing up the status quo for most of their headline heroes and titles. Batman's got new teammates, Wonder Woman's origin is one massive lie, and there's even a Flash returned from the (editorial) grave. But it's a strange twist of fate that a story told on both comic book page and the big screen, both months, if not years in the making, should arrive at the same time: as Batman V Superman saw the Man of Steel fall in combat, the New 52 version of the comic hero did as well - leaving the door wide open for replacements. And replacements, they are a-coming. Whether it's Lois Lane, the new Superwoman, Kenan Kong, the new Super-Man, or the returned Man of Steel familiar to fans of the hero in the 1990s and 2000s, there's no shortage of 'Super' heroes. But it's Metropolis' other favorite son who's claimed the title for himself. It's a new era for DC Comics, and a new era for Lex Luthor, too. So for fans of Superman stories in every medium, we thought it best to explain to fans why, and how Lex Luthor has emerged as Metropolis' new Superman... and why he might actually be doing it for the right reasons. For real. To those thinking that Lex Luthor is still a villain, the New 52 was out to prove that assumption wrong almost immediately. When the Crime Syndicate (the evil doppelgangers of the Justice League from Earth-3) managed to imprison all of Earth's heroes, it was Captain Cold, Black Adam, Bizarro and others led by Lex Luthor (in his armor suit) who saved the day. The result was an official (if hesitant) invitation to the Justice League. And, as a brilliant billionaire who cared about nothing more than protecting and preserving the planet, who could say he wasn't worthy? Then came "Darkseid War," the Justice League comic event that acts as prologue to the DC Rebirth, sending the League's heroes up against both Darkseid and the Anti-Monitor. We'll spare you the details, but in the story, Lex Luthor wound up mistaken as a savior to the residents of Apokolips - even imbued with Darkseid's famous 'Omega Beams' (for a full explanation, head over here). The bottom line: the story saw Lex de-powered, but taking the throne as Lord of Apokolips, gracing his armor with the Superman 'S,' and taking possession of his very own Mother Box (an Apokoliptian device that can do... just about anything). With the "Justice League" arc wrapping up not long before the official DC Rebirth kicked off, the next time readers got to see Lex, he was sporting the same armor (and a new cape), and emerging in Metropolis not long after the death of its Superman (the younger New 52 version). Rising above the people of Metropolis and proclaiming himself as the new Superman, wearing the cape and symbol of the superhero as a tribute, he vowed to keep the city safe. And that, frankly, was too much for the pre-New 52 Superman hiding out to stomach. A quick Kryptonian shave and uncovered costume later, the real Superman appeared on the scene. Unfortunately, this out-of-time-and-space Superman was still harboring the ill will towards his own planet's version of Luthor, who was a proven villain and deceiver (and former President!). The two began trading blows not long after, only forced to stop when a supervillain re-appeared to take advantage of the disorder. Leaving one massive question: is Lex Luthor actually trying to pull one over on Metropolis and Earth? Or is Superman completely wrong, and relying on his prejudice towards any Luthor - harming the city in the process? Thankfully, the new (and final) issue of "Justice League" prior to the Rebirth relaunch sets those issues to rest - with some surprising reveals. The issue is actually set before the showdown in "Action Comics" #957, and offers new context for Lex's journey from Apokolips to the streets of Metropolis (or the air above them). And it all begins with Lena Luthor, Lex's sister, who attempted to kill him prior to the "Darkseid War" event thanks to the dark influence of the same Apokoliptian technology. Now in a coma, Lex has returned to her side - with all the power and authority in the world, but unable to fix her in any way. It's that wake up call, we're told through Lex's inner monologue, that has caused his view of the world to change so drastically. 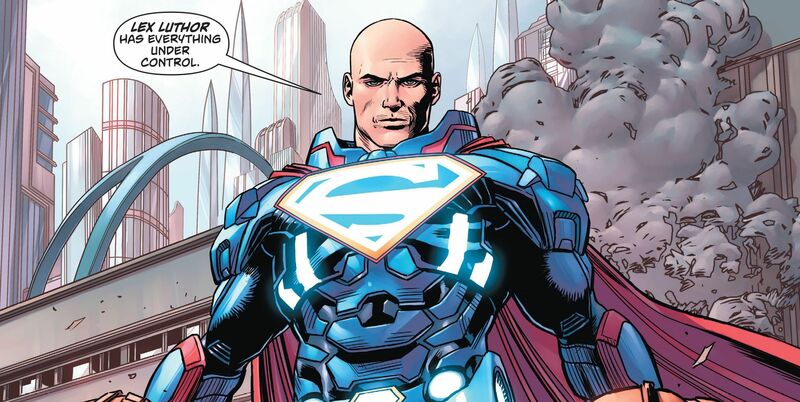 With his new position, Lex could have been the lord of an entire planet, galaxy, or galaxies if he so wished. But the reason that he has, apparently, left it all behind is simple: his sister wouldn't approve. And, as he tells us, nearly all of the things made possible for him by leaving Earth behind he always possessed the power to accomplish (he may be good, but he's still got an ego). So, upon seeing Superman's cape posed as a memorial in the lobby of the Daily Planet newspaper, he has an idea. An idea for a new mission. By purchasing the newspaper, the cape becomes his property - meaning he is free to take it down, and place it on his own shoulders. While Lex clearly has more love for Earth than for the Man of Steel, his closing narration makes it abundantly clear that he is taking the title of 'Superman' for as good a reason as any could hope. While Lena Luthor may not have approved of her brother becoming a galactic tyrant, she would approve of him "trying to be a better man. Someone you can be proud of. A symbol of inspiration." And as he places the cape on his own shoulders, in colors now matching those of the Man of Steel, he promises that when Lena wakes up (of her own accord, not Lex's Mother Box) she will be proud of the hero Lex has become. It's a compelling twist, and the decision to release this issue's story even after Lex makes his intentions known to the public shows DC is committed to the character direction. And if the "Superman" philosophy believes anything, it's that anyone, no matter their past or personality, can become a force for good. Right? Let us know what you think of the decision to make Lex a good-intentioned hero, and the returned Clark Kent the one giving in to suspicion, anger, and doubt. Justice League #52 is available now.